Shoppers with a keen eye for a bargain are snapping up boxes containing 5kg of “wonky” fruit and veg for just £1.50 from Lidl. The German discounter introduced the Too Good To Waste food boxes and they have proved an instant hit with its customers. The “green” goody parcels are packed with fruit and veg which have become slightly damaged, discoloured or deteriorated but are still perfectly good to eat. 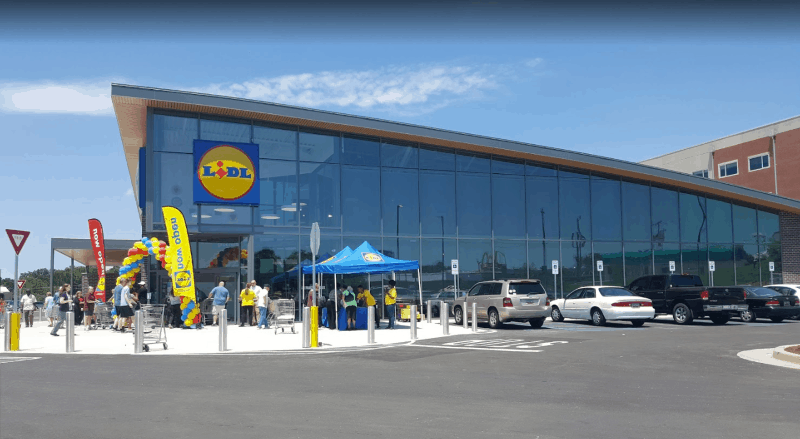 Lidl announced last Wednesday plans to roll out the product permanently nationwide in a bid to reduce food waste in store. The 52-year-old is a cook at a care home where the fresh produce went down a treat among elderly residents. She said: “I go to Lidl instead of Tesco to get a good price for my food. “I work for a care home so I bulk buy food and always keep my eye out for a bargain. “When I saw it I thought I could get double the amount for half the price and cook something for the residents. “There were a few onions, some peppers and some mushrooms in there and a punnet of cherries which I used to make a fruit crumble. Sean Oates, from Finsbury Park in north London, also spotted the fresh food boxes today at his local store and said it could encourage him to be more creative with his food. “I think the boxes are a great idea and maybe they could encourage me to be more creative with my food. “When I got to Lidl this morning, there were no boxes left but I will look out for them in the future. “Us shoppers are a bit lazy – we are always looking for easy options but things are changing now, especially in relation to managing food waste. But not all shoppers were sold on the new bargain bulk buy boxes. Paul Weeks, from north London, said: “I think it is a good idea for people who want a bargain who go through a lot of fresh food. “It’s a great idea to help control food and wast management – if it goes to the right customers. “The fruit and veg I buy usually goes off in the fridge before I can get through it all. The veg boxes have been permanently rolled out to all 760 Lidl supermarkets in Britain after a trial run at several London and Midlands stores. The launch follows a successful trial in August which was gradually extended to 122 stores. Lidl sold more than 50,000 Too Good To Waste boxes and prevented 250 tonnes of food going to waste. Christian Härtnagel, CEO of Lidl UK, said: “The positive feedback that we have received off the back of our trial has been incredible. “From our colleagues who are showing so much passion for them, to our customers who were getting in touch from the get go asking where they could get one.